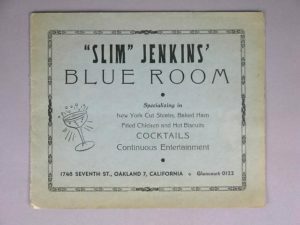 Harold "Slim" Jenkins was an African American entrepreneur and owner of the renowned Slim Jenkins Supper Club in Oakland, California, made popular during the 1930s to 1960s. Jenkins was born July 22, 1890 in Monroe, Louisiana and relocated to Oakland shortly after World War I, and found work as a waiter. 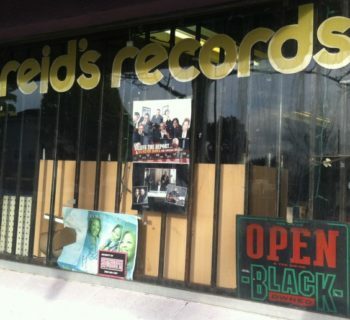 Oakland served as an urban center for African Americans migrating from the South and black businesses flourished along Seventh Street, Oakland’s black business district. 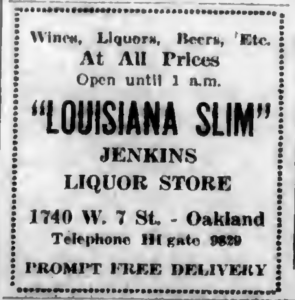 Slim Jenkins saw the economic opportunity in the business district and opened the city’s first liquor store December 5, 1933, the same day as the repeal of Prohibition. Jenkins’ store, located at 1748 Seventh Street, soon expanded into the Slim Jenkins Café, which included his famous nightclub, restaurant, banquet space, and a market. The club was strategically located near the rail yards and the sites of former jazz clubs made popular in the 1920s. 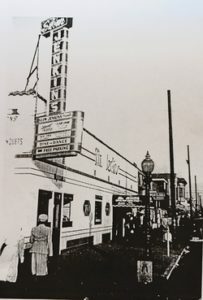 Jenkins capitalized on the club’s location, increasing patronage, but also attracting racially mixed, middle-class clientele. Jenkins offered performances by celebrated African American musicians, including B.B. King, the Inkspots, Dinah Washington, and Nat King Cole. The club also boasted a high-profile clientele, among them President Franklin D. Roosevelt, several Oakland mayors, and William Knowland, a Republican senator and owner of the Oakland Tribune. 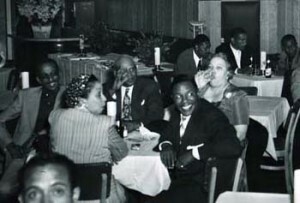 The Slim Jenkins Supper Club enjoyed such wide success that rumors surfaced that the club was financed by local gambling ringleader Charles “Raincoat” Jones, but those rumors were never substantiated. Jenkins successfully operated other businesses in the Seventh Street district and was known for his affiliation with and donations to the Republican Party. 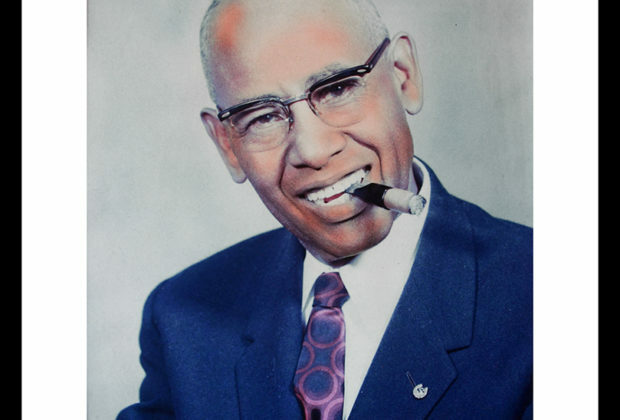 He was affectionately known as the “Mayor of West Oakland” and was a member of the Port Oakland Community Club, the Boys Club of Oakland, the National Association for the Advancement of Colored People (NAACP), and served as vice president of the Transbay Federal Savings and Loan Company. The Seventh Street district was forever altered during the 1960s when the United States Postal Service demolished twelve blocks of property to erect a new postal facility and again with the arrival of Oakland’s public transit system. 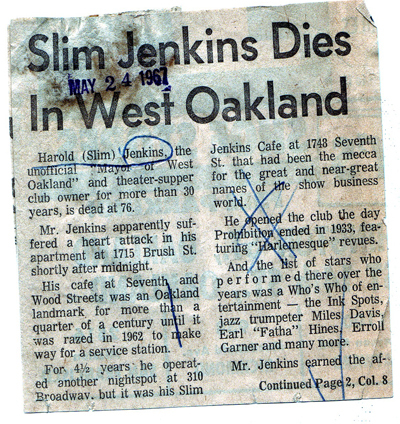 Jenkins was married to Elsie Jenkins and died at the age of 76 in Oakland in 1967. Founded in 1933 by Slim Jenkins, Slim Jenkins’ Place began as little more than a corner juke joint. Under Jenkins’ disciplined hand, it soon became the premiere club in 7th Street’s blues and jazz orbit, widely recognized as West Oakland’s favorite nightspot. 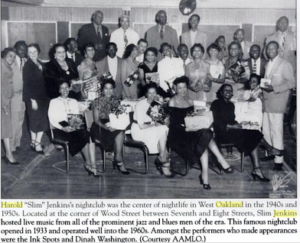 Jenkins wanted to create a place where clientele of all races could listen to music, dance, and enjoy themselves. And enjoy they did. Observers recall lines around the block, and taxis coming and going, filled with people heading to Slim’s to see the headliners. The neon flashed above them and the streets sparkled under their feet. For more than two decades, through the thirties, forties and beyond, the club featured star players to rapt audiences. The setting was elegant, with tables covered in white tablecloths and candles flickering in the dark. The musicians were illustrious. Among them; Louis Jordan, B.B. King, Charles Brown, The Ink Spots, Ivory Joe Hunter, Duke Ellington, Sarah Vaughan, and many others. 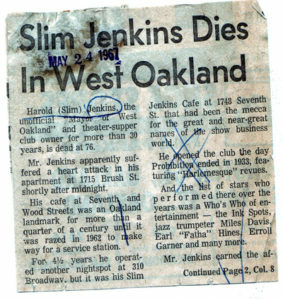 The club was also referred to as Jenkins’ Corner, or Slim Jenkins’ Supperclub. 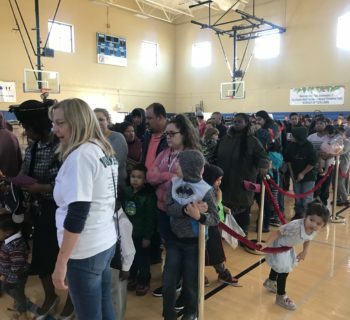 It was impressive enough to draw crowds and inspire other people’s dreams. Esther Mabry, one of Slims’ waitresses, opened her own restaurant, then a club, on 7th Street with Slim’s encouragement. Jenkins liked to nurture dreams. He promoted bands and musicians he liked. 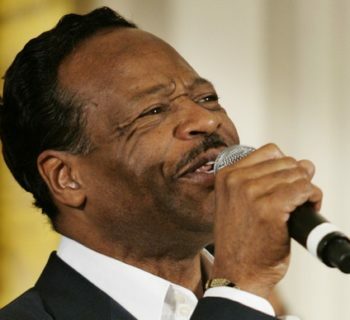 He helped make The Platters famous by changing their wardrobe and featuring them at the club. 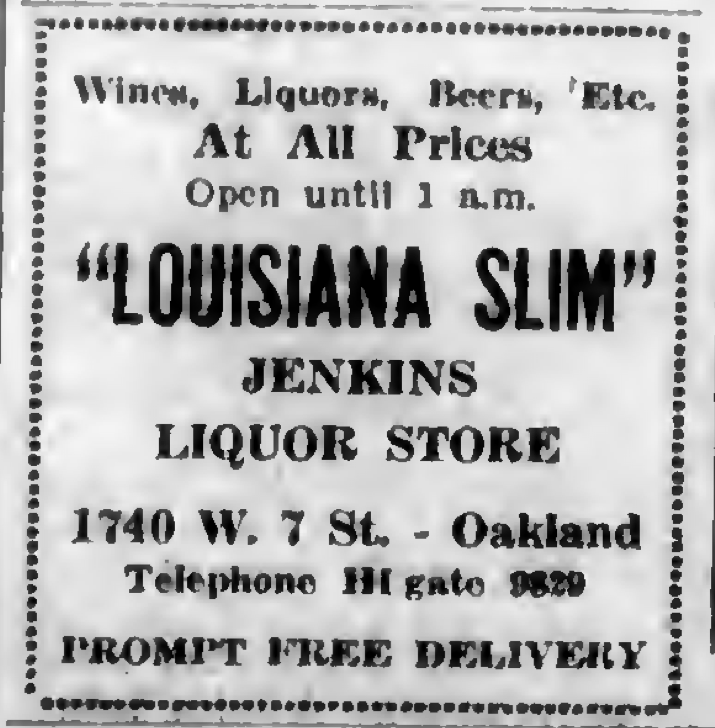 Reportedly, Slim Jenkins didn’t mess around when it came to business. He insisted that the bands performing at the club behave professionally. According to James Moore, “Back then, people felt a responsibility for the music. That was reflected in how they dressed. They (the musicians) dressed out of respect for the art form.” Bob Geddins remembers that Slim didn’t even tolerate “scraggly” customers. After more than two decades, the club maintained an impeccable reputation. When the club was razed in 1962 to make way for a gas station, (Jenkins never owned the land on which his club was built) and tried to move elsewhere, the city and police vouched for him. After a local church protested Jenkins’ attempt to move the club to their neighborhood, he settled instead on Broadway Street in Oakland, near Jack London Square. He operated the club until his death in 1967. Slim Jenkins’ Place had many incarnations. From humble beginnings it grew to house a restaurant, banquet room, bar, liquor store and market. Jenkins was always renovating, expanding, and changing to meet the needs of the public, honor the music, and suit his personal style.